LIVE DEAD 69 returns to Under the Bridge performing “Live/Dead ’69” and “Skull & Roses ’71” in their entirety over two exclusive nights! All Star Line up performing the first two live albums by The Grateful Dead in full. Tom Constanten was the pianist with The Grateful Dead and he returns to London’s Under the Bridge with an all star line up featuring members of Jefferson Starship, Bob Weir’s Ratdog and David Crosby’s Band after bringing the house down at their last Under the Bridge concert. 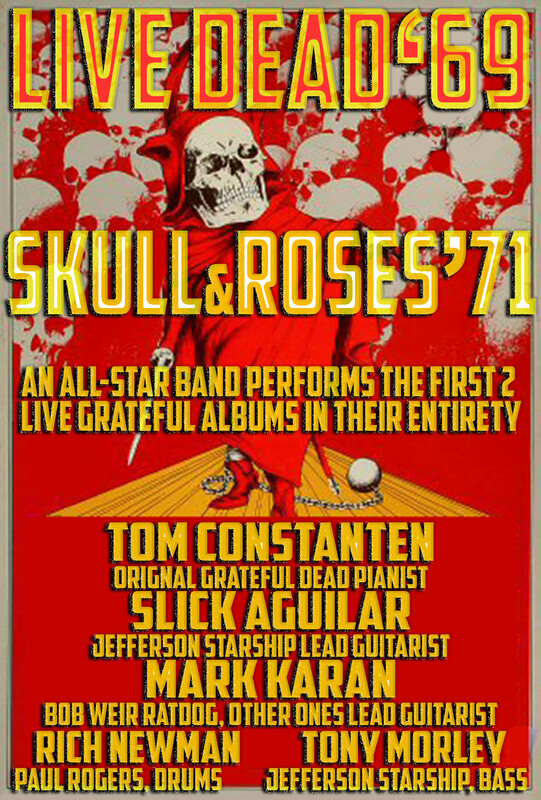 Along with performing the “Live Dead 69” album, this time the group take on the “Skull & Roses” album from 1971 in it’s entirety. This was the second live album released by The Grateful Dead and their first certified Gold album. Tom Constanten originally started performing with Steve Reich & Terry Riley. His friendship with Grateful Dead bassist Phil Lesh led to him joining the band in 1968. Mark “Slick” Aguilar is best known as the guitarist with Jefferson Starship. He has also worked with the David Crosby Band, Buddy Miles and KC & the Sunshine Band. Mark Karan is the guitarist with Bob Weir & Ratdog. Mark has also toured with Dave Mason, Paul Carrack and was chosen to fill the slot of Jerry Garcia in 1998 with The Other Ones, a band featuring former members of The Grateful Dead.